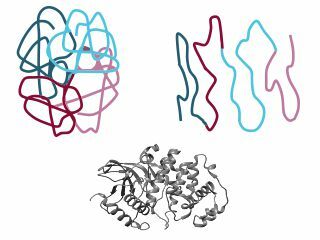 ERK2 (MAPK1, mitogen-activated protein kinase 1) is an important player in multiple biochemical signalling pathways and is involved in different cancer types. In this example study, we analyzed the thermal stability of ERK2 under 30 different buffer conditions. 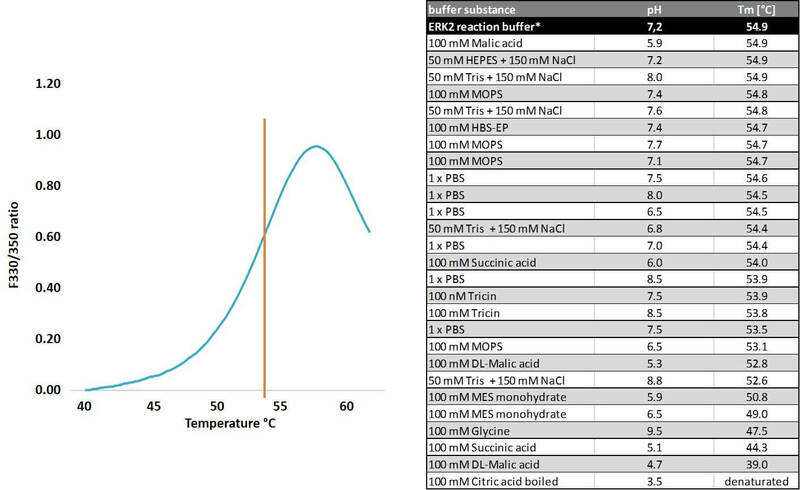 Tm was calculated in different buffer substances with different salt concentrations in a broad pH range (4.7 to 8.0). Results of these assays present ERK2 reaction buffer (12.5 mM b-glycerophosphate, 7.5 mM MgCl2, 0.5 mM NaF, 0.5 mM vanadate) to be the most adequate buffer for a high ERK2 stability with a Tm of 54.9°C. After boiling the protein for 5 min in citric acid pH 3.5, the protein is completely unfolded, no Tm was identified. This is an example for a negative control.